It's hot as Hades out there, so not much working outdoors this weekend (did collect some duckweed kayaking on the pond though....that'll go down to the garden). Has been mid-90s through the weekend, 99º today, 100º predicted for tomorrow. 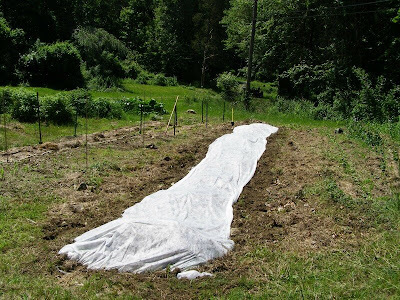 After getting a report out to a customer this morning, I took a half hour to finish up what I started Sunday -- get the Remay floating row cover on the summer squash. Actually Agro-Fabric was the brand name I used. About $35 including shipping for 5' x 100', needed about 50'. Should last several seasons, so that's about a six year supply. 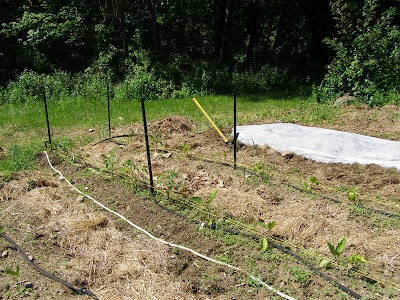 If all goes to plan, that should let the plants get established before Squash Bugs can get to them, and time to use the trap crops to reduce the population of adult Squash Bugs. Hopefully I can concentrate them on the trap crops and destroy most of the adults and egg masses / nymphs before uncovering the summer squash. I'm a bit concerned I have it spread out too much. I may need to move the sides in a bit to give more slack for the vertically growing plants, we'll see. 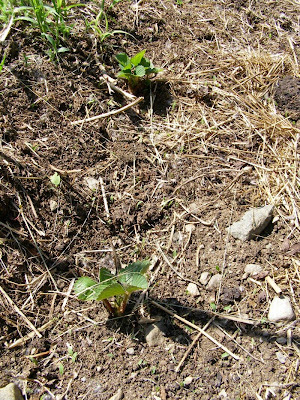 Bush Beans are up. I seem to have had a lot of bean seeds fail to germinate, however. 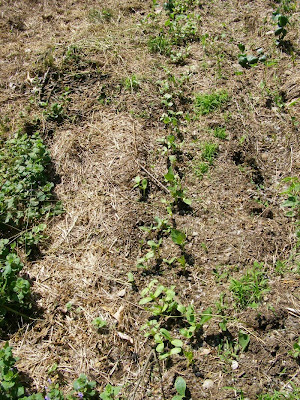 The tomatoes, and peppers and eggplants, in the rows are doing OK. Should be ready to add another string by next week. 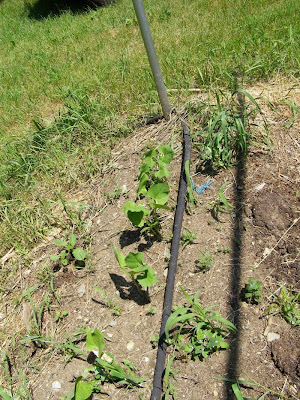 Pole Beans & Sunflowers. Need to thin out the sunflowers soon.